Turning away from Bloomberg and Apple for the moment (rest assured, I still have many thoughts to post on both; I am particularly intrigued by Bloomberg's Polarlake acquisition and how it pushes it towards to world of Big Data), some more thoughts on the shifting platforms of Facebook-land. Some interesting data-points in this arena over the last couple of days. A million users's isn't cool. Do you know what's cool? Facebook announced yesterday that as of 14th September it had hit a billion monthly active users. Extrapolating that forward it implies 1,009m MAU's at quarter end, up from 955m in Q2. What was more interesting however was the underlying in the appendix. That's not that surprising. It's the inexorable law of large numbers, but its also a reason why large companies tend to attract lower valuations than smaller ones. The second thing is that they mentioned in the appendix that mobile users hit 600m. This means mobile users are now a stonking 59% of the mix (they didn't disclose the more interesting mobile-only users in this release; for context this was 11% of MAUs at Q2). Remember mobile users are lower revenue than Facebook, and judging from my experience, Facebook haven't figured out how to drive this up. My wife continues to be spammed daily by adds for Salesforce.com, and I remain unconvinced that a soil mechanics PhD student really needs a mid-market on-demand CRM system. Median age for Q309 and Q311 not provided, so this is interpolated, weighted by (reported) MAU user growth. This is curious. I would have thought as Facebook became more mature and extended beyond its campus-origins, the average age of new users would have gone up. Instead it's actually fallen consistently from 26 in the early years to 20.4 in the last twelve months. 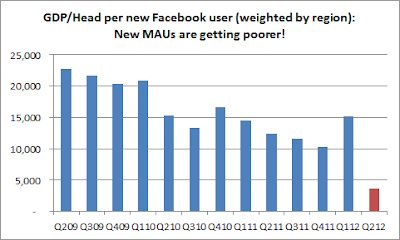 Remember Facebook's big challenge is to increase ARPU - but if you're new users are getting younger this is a headwind because younger people tend to have lower disposable income. Yikes. 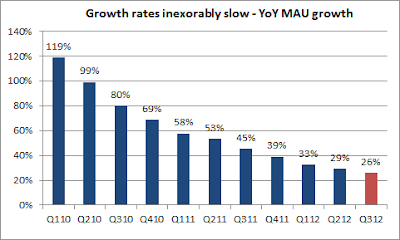 So in summary, Facebook's volume growth is slowing, is shifting towards lower ARPU mobile customers and its new customers have less money to spend. Are you sure this is the kind of stuff you want to issue a press release about??? assuming that (previously growth) Ad Revenues were flat in Q3. Remember Zynga accounted for 10% of Facebook's revenues in Q2 (though now highly likely to fall in Q3!) so the presenting issue is that this is (yet) another revenue growth headwind for FB. However this is only the presenting issue. The underlying issue is a more fundamental problem of Platform Risk. This is something I touched briefly on in August and I want to write more about next week. 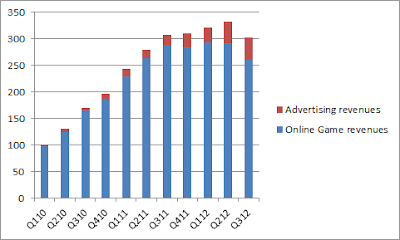 Zynga is dependent on the Facebook desktop platform for a large chunk of its revenues. Users (as we saw above) are shifting away to a mobile platform where ARPU is drastically lower. Zynga do not control the platform users are on, and do not control their destiny. This is an issue for Facebook on two levels. 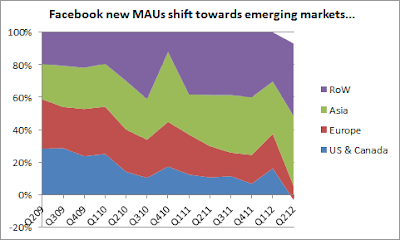 On one level Facebook are also exposed to mix shift to lower ARPU. Facebook is dependent on the Android, iOS and Windows platform for a large chunk of its revenues. Facebook does not control the platform users are on, and does not control its destiny.